EDMONTON — Curious crows, acrobatic squirrels and marauding raccoons are the culprits behind a multi-billion-dollar loss to the economy each year. It happens when birds and animals manage to span the gap between live wires and the grounded metal structures at power substations. The creatures are fried and the systems short-circuit, causing a power outage and damaging electrical equipment. The cure looks simple, but only Edmonton’s fledgling Cantega Technologies has been able to provide the common sense solution — supplying tight-fitting plastic covers for a wide variety of equipment. And soon, they will be able to do this while the system is turned on — a huge advantage for utilities which are loath to shut down power. “We did $2.5 million in business this year, and we have no sales force,” said Marty Niles, chief executive of the power system protection firm. Thanks to a $500,000 investment from AVAC Ltd., a private not-for-profit Alberta company that is seeded with government money and invests in promising early stage businesses, Cantega plans to build a sales and marketing force to cover Canada and the U.S. It is also close to a deal with a global utility equipment supplier. Niles and some of the other Cantega staff are former transmission linemen. What Cantega staff do is take photographs, using careful reference points, of the equipment that needs protection. When that information is fed into a computer, it yields a precise image from which a model can be constructed. Injection moulding can then create a “greenjacket” in a matter of minutes. However, with a warehouse containing more than 400 moulds from previous work, a perfect match is likely to be found there for most projects. “We offer the complete service. We know what needs protection at a site, and how to do it,” said Niles. The plastic covers cost $100 to $500, and many dozens of sizes are needed for the average substation. 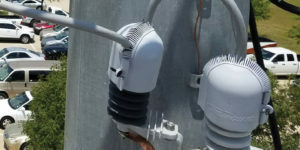 But while utilities may install the covers on new systems, turning off the power to retrofit them is a different story. Niles said a new device being tested includes a long pole that can insert and tighten the auto-industry plastic fasteners needed to hold the covers in place. The key to any firm which has a good idea is an ability to test its device. And AltaLink, an independent transmission firm that was spun off from TransAlta Corp., has been Cantega’s anchor client. “When you are able to refine your product in your backyard, that’s great. It is because of AltaLink’s commitment to reliability that we are here today,” said Niles. Cantega has sold its power protection systems to major utilities across Canada. In the U.S. its biggest customer is California’s giant Pacific Gas and Electric utility, which is very interested in the advancement which allows Greenjackets to be added to a “hot” system. “With air conditioning running down there, the system is near its limit and can’t be shut down,” he said. After the massive 2003 power outage which left a big part of the eastern U.S. in darkness — a cascading outage initially caused by a tree falling on a line in Ohio — the U.S. vowed to strengthen its power grid. “They have pushed on vegetation management, like falling trees, but they have not addressed wildlife,” said Niles. U.S. power researchers have estimated about 18 per cent of all power outages are caused by birds and animals. Power outages of all types cause $150 billion in losses to the U.S. economy — such as lost work on computers and planes diverted from airports. It would cost $50 million to protect Canada’s 7,000 substations with Greenjackets, and $3.5 billion to do the same job in the U.S. The total global power protection market is estimated at $22.2 billion. “Interrupted power has been called the biggest risk of all to business,” said Niles.